Today continues the April A-Z Challenge. This month, I'll be blogging (almost) daily about a different speculative fiction trope, one for each letter of the alphabet. Today's entry is on Judgment Day. The Apocalypse. The end of the world as we know it. In speculative fiction, the concept takes many forms. In sci-fi, it's frequently attached to the alien invasion trope. An extraterrestrial army attacks Earth and attempts to exterminate humankind, effectively bringing about the apocalypse from the viewpoint of the puny humans. A famous film example of humanity struggling in the face of an alien apocalypse is the 1996 Roland Emmerich explosion-fest, Independence Day. A fleet of warships roll in, blackening the skies of major cities across the world. 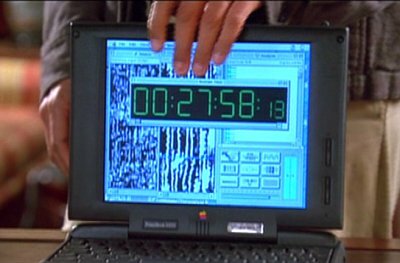 An Apple Powerbook-wielding Jeff Goldblum discovers a countdown signal the aliens are using to coordinate, and when the timer expires: boom. Of course, the concept permeates not only fiction, but some of the core cultural forces of our world. Most of our prevalent religions have an "end of days" prophecy, to the extent that some adherents anticipate its arrival with an intense fervor, convinced the day of reckoning is at hand. The very title of this entry comes from the eschatological worldview of the Abrahamic faiths, in which it is believed that God will ultimately judge the nations of the earth, saving his true followers and condemning the rest. In high fantasy, the protagonist is usually seen crusading against a dark lord who seeks to lead an apocalyptic wave of conquest and destruction across the land. His evil ambition may only extend to an iron rule of the realm, or the dark one may even attempt to usher about a literal armageddon. In either case, the protagonists of the story see it as an end to the world as they know it, and will fight to the death to prevent the villain's ascension. The popular mold for this version of Judgment Day was cast by J.R.R. Tolkien's Lord of the Rings, which saw corrupt demigod Sauron grasping for dominance of the world his predecessor Morgoth had sought to destroy. My own work has yet to feature any world-ending events, though I do have a story or two that take place in a post-apocalyptic setting, which is a trope all to its own. Many works of fiction depict a world that has already ended, the story taking place long after, in the devastation that's left behind. Often the writer will set up these kinds of tales by depicting the event itself. Or, they may let the reader decipher the cause of the unseen destruction by trailing breadcrumbs throughout the story. I don't know if our real-life world is headed to its end. A lot of people seem convinced of it. Humanity has obviously shown itself capable of unsettling levels of self-destruction in the past, and continues to show grim potential in its darkest moments. But I'm fairly optimistic that the world and its inhabitants will keep chugging along on the path of progress, and hopefully I won't see any Great Judgments in my lifetime. After all, as much as I like post-apocalyptic stories, I really can't be bothered to star in one. Absolutely! I'd recommend both of them to any epic fantasy fan who's willing to commit to a huge series. Great books! The Apocalypse, the highest of stakes one can measure characters up against. It can take many forms, like you said, from destruction by alien invasion or evil overlord, doom by disbelief in the right deity, misused technology (such as wormhole devices that split open the universe with the push of a button, time machines that aid in irreversibly damaging the time-space continuum, or AIs that go haywire and try to protect humanity from itself through destruction), or... hm... why does a union between Justin Bieber and Rebecca Black come to mind? Oh, unholy of unholies! The imagery! You know, I was tempted to mention the large hadron collider since there was that small uproar of people a couple of years ago who seemed to think that was going to be a wormhole device that split open the universe with the push of a button. Dear God, the strangelets! But I thought better of it. Dude, this is creepy. You have any idea how much you've just scored by ridiculing the LHC's power to spew black holes? You forgot to fist bump! Chrono Trigger, in my opinion, is the best video game ever made. Plot, depth, detail; if it weren't 8-bit, kids today would still be knocking each other over to play it. Not so much for the starring in a real-life post apocalypse myself. :) Not that I don't have a set of Zombie Apocalypse plans A-Z. A-Y involve forming a new colony of uninfected humans and surviving depending on the type of zombie. ZAP Z is simply, "Bite as many suckers as I can before one of 'em removes my jaw." Because hey, someone's gotta be the shambling horde. It just might be! It's definitely up there with the greatest of all time for me. I still give it a play through every few years or so for old time's sake. I wonder how many new people were exposed to it with the iOS version that came out not too long ago? It's never a bad idea to plan for Z-Day! Mine involves making my last stand on the roof of a warehouse down the block from me. Lots of canned food and water inside, and a fleet of forklifts to block the entrances! Me and my dumbphone would have no idea... lol! But I think a version did come out for one of the handheld systems, didn't it? Given the popularity of redos and revisits, I wonder if they'll ever try to remake the game with modern graphics, or turn it into a movie. That would be interesting. A remake would be awesome, if handled correctly! But the dream team that made the original is long gone by now, and it would be tough to measure up. I think you're right, they did a Nintendo DS version of it semi-recently. It still holds up, in my opinion! I agree with Juturna on Chrono Trigger. And Independence Day is another one of those movies that I watched constantly as a kid. You're a pretty talented writer to belt these very informative (and very well written) posts so fast! Kudos and once again thanks for a good read! Thanks so much, Randi! I really appreciate it! To be honest, this A to Z challenge is starting give me a bit blog fatigue. I had a few written ahead of time, but I came into it too late to really prepare all of my stuff in advance like some people were able to do. It's been great fun, and I've met lots of new bloggers, but considering I only just started blogging a couple of months ago it's a little overwhelming! I'm still enjoying it though. Next year I'll have more time to prepare for the A to Z grind. Awesome post! Almost makes me wish I wrote fantasy. What's stopping you? It's great fun, I promise! I love losing myself in worlds unrestricted by the limitations of the real world. It figures into a lot of fantasy. Haven't used it in my science fiction books - YET! There are definitely parts of the world that experience things that we'd describe as apocalyptic if they were to take place over here! Puts our silly problems into perspective when you think about it. Fallout 3 was an excellent game. I still play it from time to time. I agree, great game! I was a huge fan of the first two, so I was actually a bit worried before it came out, since it looked like it would just be "Oblivion with guns," but it ended up being a fantastic game. Can't wait to see where they take it next!